'Late Nite Catechism', the popular classroom comedy, returns to the Playhouse stage. 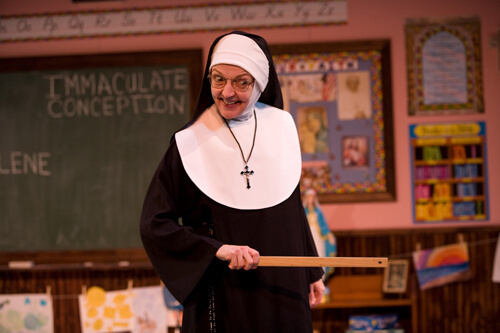 The Omaha Community Playhouse wraps up its 90th anniversary season with the return of Late Nite Catechism, featuring Mary Zentmyer in the role of Sister. Zentmyer has been performing as Sister for almost 20 years now, and this marks her fourth return to the Playhouse stage. She said she’s excited to be a part of the Playhouse 90th birthday. Zentmyer noted how show has evolved over the last two decades. At first, audiences were mostly Catholic adults reliving their school days of years past. But more and more, she’s noticed theatre goers of all walks of life attending and enjoying the show. She said one thing has changed for sure. Late Nite Catechism is described as Loretta Young meets Carol Burnett. It’s part catechism class, part stand-up routine. You, the audience, are part of Sister’s class. She’ll take you back to the days of the Latin Mass, meatless Fridays and remind you about the good old ruler across the knuckles. Zentmyer said the funniest moments in the show are the true life stories that people tell to Sister. It’s an important element to the show for her, seeing people take stock of their lives and smiling at the craziness of their past while looking toward the future with a comedic eye. The Omaha Community Playhouse’s special event, Late Nite Catechism, is running now through July 19th. For more information on the show, visit www.OmahaPlayhouse.com.